View cart “New! 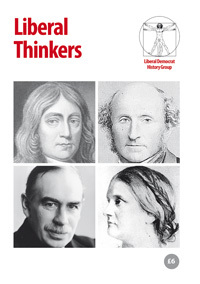 – Liberal Thinkers” has been added to your cart. 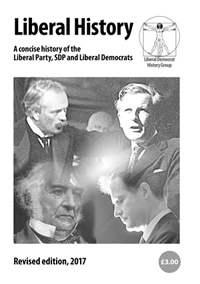 The Liberal Democrat History Group’s booklet, Liberal History: A concise history of the Liberal Party, SDP and Liberal Democrats, has been revised and updated to include the 2015 and 2017 elections and their aftermath, including the election of Vince Cable as leader. Now up to date as of July 2017. Starting with the earliest stirrings of Liberal thought during the civil wars of the seventeenth century, the booklet takes the reader through the emergence of the Whigs; the growth of radical thought; the coming together of Whigs, radicals and free-trade Peelites in 1859 to form the Liberal Party; the ascendancy of the Victorian Liberals under Gladstone; the New Liberalism of Asquith and Lloyd George and the party’s landslide election victory in 1906; dissension during the First World War and the party’s eclipse by Labour afterwards; the long decades of decline until nadir in the 1950s; successive waves of Liberal revival under Grimond, Thorpe and Steel; the alliance with the SDP and merger in 1988; and the roller-coaster ride of the Liberal Democrats, from near-obliteration in 1989 to entry into government in 2010 to electoral disaster in 2015 and, now, the first signs of recovery. The essential introduction to Liberal history. 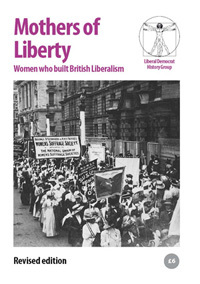 Full price £3; 20% discount for Journal of Liberal History subscribers; see page 3 of the most recent issue of the Journal for the discount code to apply when ordering this item. The booklet makes an ideal gift from local parties to their new party members; we can offer a 50 per cent discount for bulk orders of 40 or more copies. To order, click here.